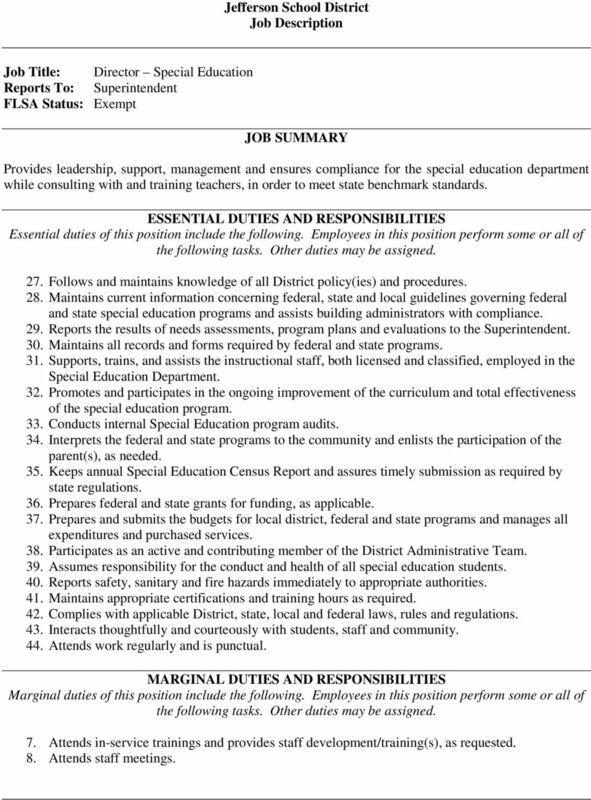 Download "MS Principal & Special Education Director"
3 Marginal duties of this position include the following. Employees in this position perform some or all of 1. Attends in-service trainings. 2. Attends/facilitates staff meetings. 3. Attends educational support meetings, including Individualized Education Plan (IEP) meetings, and school board meetings. 4. Inspects facilities and campus for health and safety concerns. 5. Chaperones/supervises school activities, events and campus as needed. 6. Substitute teaches, as necessary. 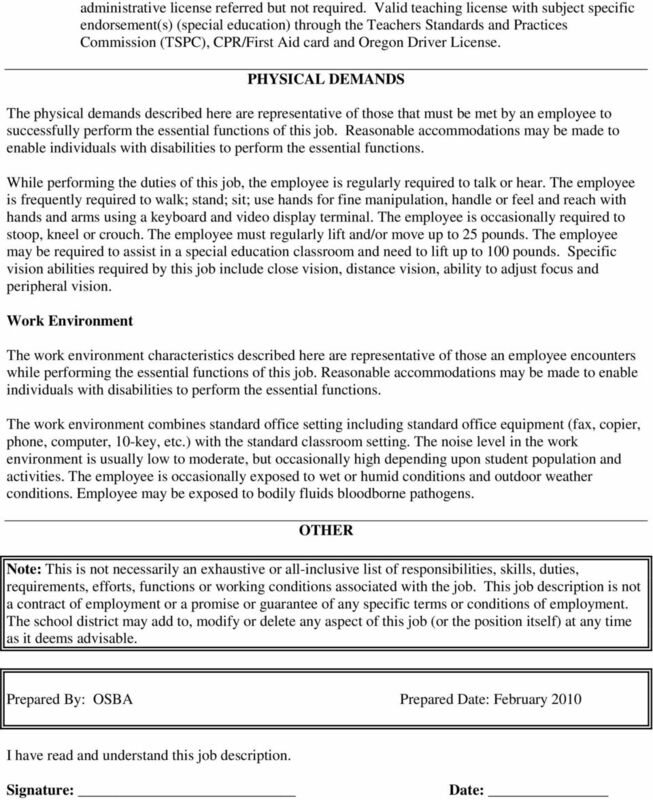 SUPERVISORY RESPONSIBILITIES Supervises, evaluates and directs the work of assigned classified, licensed and confidential employees according to District policy. Resolves grievances and other employee relations issues while working closely with the district office and disciplines employees appropriately. All school employees have some responsibility for supervising students and assisting in maintaining a safe environment. QUALIFICATIONS To perform this job successfully, an individual must be able to perform each essential duty satisfactorily. 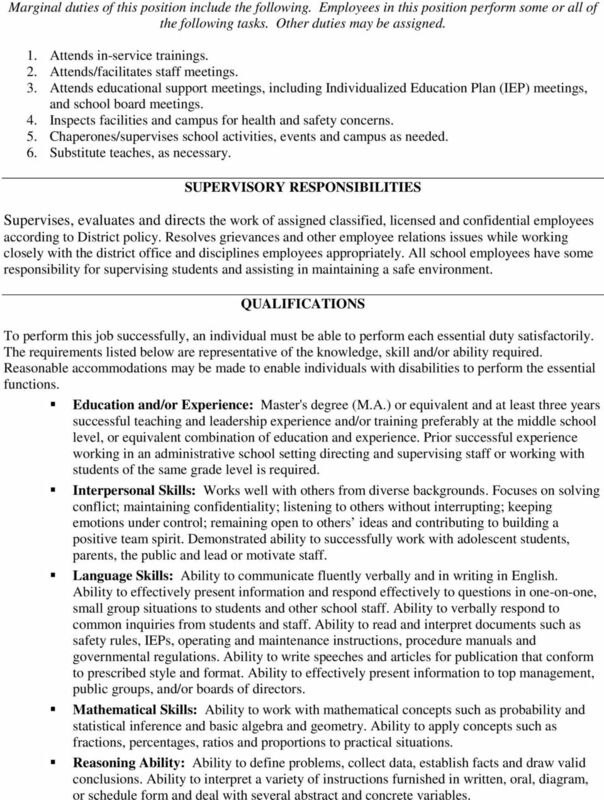 The requirements listed below are representative of the knowledge, skill and/or ability required. Reasonable accommodations may be made to enable individuals with disabilities to perform the essential functions. Education and/or Experience: Master's degree (M.A.) or equivalent and at least three years successful teaching and leadership experience and/or training preferably at the middle school level, or equivalent combination of education and experience. Prior successful experience working in an administrative school setting directing and supervising staff or working with students of the same grade level is required. Interpersonal Skills: Works well with others from diverse backgrounds. Focuses on solving conflict; maintaining confidentiality; listening to others without interrupting; keeping emotions under control; remaining open to others ideas and contributing to building a positive team spirit. Demonstrated ability to successfully work with adolescent students, parents, the public and lead or motivate staff. Language Skills: Ability to communicate fluently verbally and in writing in English. Ability to effectively present information and respond effectively to questions in one-on-one, small group situations to students and other school staff. Ability to verbally respond to common inquiries from students and staff. Ability to read and interpret documents such as safety rules, IEPs, operating and maintenance instructions, procedure manuals and governmental regulations. Ability to write speeches and articles for publication that conform to prescribed style and format. Ability to effectively present information to top management, public groups, and/or boards of directors. Mathematical Skills: Ability to work with mathematical concepts such as probability and statistical inference and basic algebra and geometry. Ability to apply concepts such as fractions, percentages, ratios and proportions to practical situations. Reasoning Ability: Ability to define problems, collect data, establish facts and draw valid conclusions. Ability to interpret a variety of instructions furnished in written, oral, diagram, or schedule form and deal with several abstract and concrete variables. 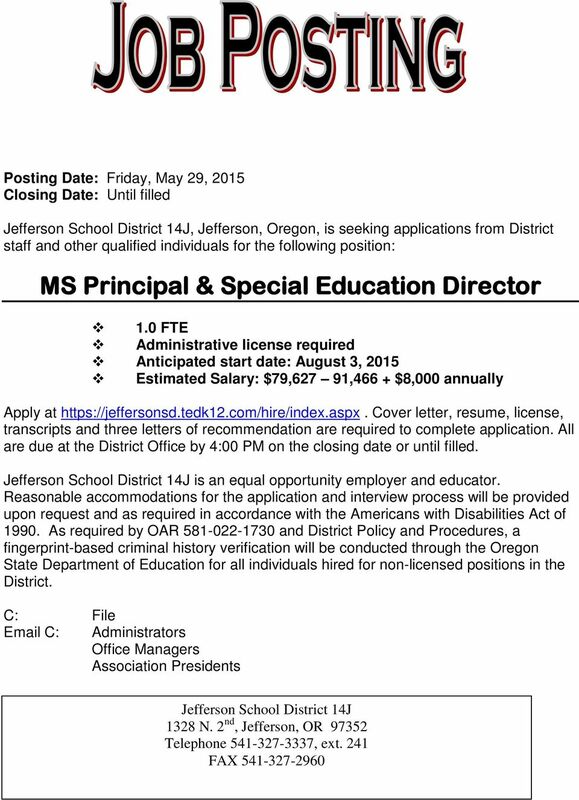 5 Jefferson School District Job Description Job Title: Director Special Education Reports To: Superintendent FLSA Status: Exempt JOB SUMMARY Provides leadership, support, management and ensures compliance for the special education department while consulting with and training teachers, in order to meet state benchmark standards. 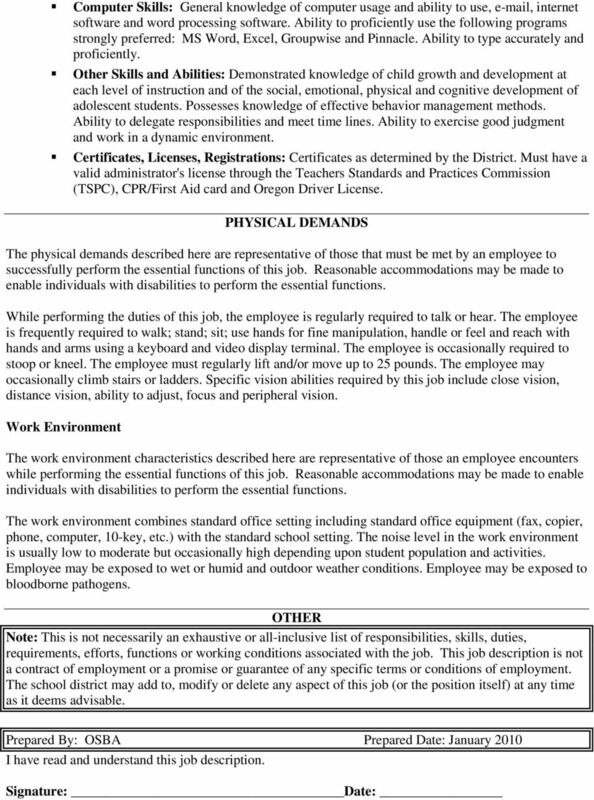 ESSENTIAL DUTIES AND RESPONSIBILITIES Essential duties of this position include the following. Employees in this position perform some or all of 27. 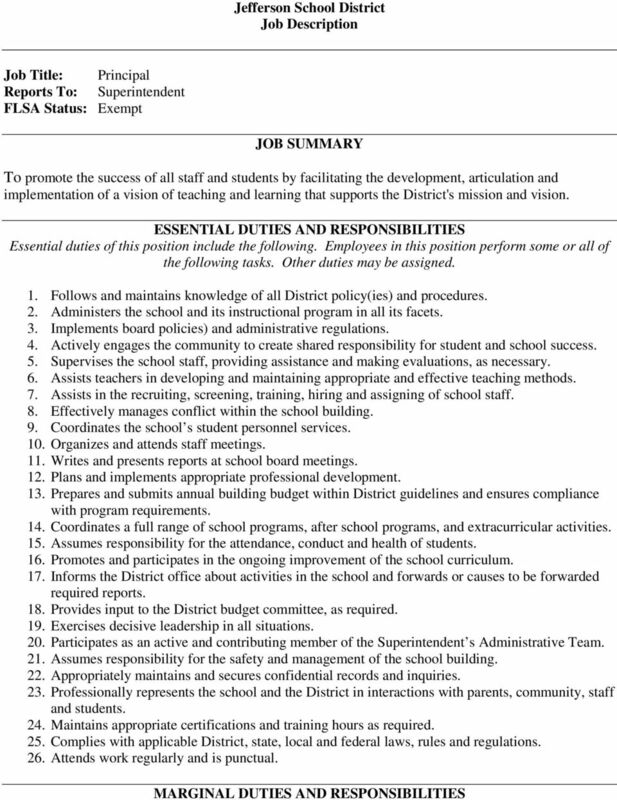 Follows and maintains knowledge of all District policy(ies) and procedures. 28. Maintains current information concerning federal, state and local guidelines governing federal and state special education programs and assists building administrators with compliance. 29. Reports the results of needs assessments, program plans and evaluations to the Superintendent. 30. Maintains all records and forms required by federal and state programs. 31. Supports, trains, and assists the instructional staff, both licensed and classified, employed in the Special Education Department. 32. Promotes and participates in the ongoing improvement of the curriculum and total effectiveness of the special education program. 33. Conducts internal Special Education program audits. 34. Interprets the federal and state programs to the community and enlists the participation of the parent(s), as needed. 35. Keeps annual Special Education Census Report and assures timely submission as required by state regulations. 36. Prepares federal and state grants for funding, as applicable. 37. Prepares and submits the budgets for local district, federal and state programs and manages all expenditures and purchased services. 38. Participates as an active and contributing member of the District Administrative Team. 39. Assumes responsibility for the conduct and health of all special education students. 40. Reports safety, sanitary and fire hazards immediately to appropriate authorities. 41. Maintains appropriate certifications and training hours as required. 42. Complies with applicable District, state, local and federal laws, rules and regulations. 43. Interacts thoughtfully and courteously with students, staff and community. 44. Attends work regularly and is punctual. MARGINAL DUTIES AND RESPONSIBILITIES Marginal duties of this position include the following. Employees in this position perform some or all of 7. Attends in-service trainings and provides staff development/training(s), as requested. 8. Attends staff meetings. MEMORANDUM. 1) Continue to develop curriculum units aligned with CT Core Standards in ELA & Math.